supported my Deserter restoration efforts over the years. required fan and all made right here in the good old USA..
other California customizers shaping things with this plastic, I've had plenty of inspiration. 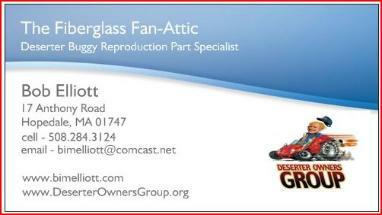 specialized parts for the restoration of the fiberglass Deserter dune buggies. My original goal was simply to make a much needed piece for one of my restorations that simply were no longer available. With a mold created, I now had the ability to provide parts for others in need of the same part? make all the arrangements for a pickup in my driveway and delivery to yours. two layers on all edges and then completely wrapping it securely with a plastic stretch wrap. - Engine Cover – 30lbs/ea – 54 in. by 56 in. by 16in. - Side Tanks – 30lbs/pair – 60 in. by 20 in. by 12 in. 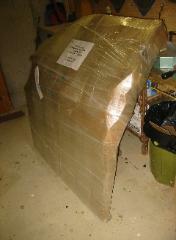 - GT Doors - 25lbs/pair - 48 in. by 24 in. by 24 in. - Front Bumper 10 lbs/ea- 60 in. by 12 in. by 2 in. to St Thomas for him. getting one, we'll be working together again. Once again, you have done a great job!! That's all for know, keep you buggy running. manage for clubs that I belong to. - The Bug Club - A very active, New Hampshire based, all VW club. buggy's made by Autodynamics and Dearborn Automotive Corp of Marblehead, MA in the late 60's and early 70's.